We are delighted to offer this great visual aid to our readers—better than anything we could have come up with. Many thanks to Michelle Swanson, Associate Planner, and the City of Olympia. Here is Michelle’s story. 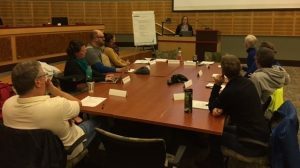 Since your training in Olympia in 2017, the City of Olympia’s Bicycle & Pedestrian Advisory Committee has been making a concerted effort to improve its parliamentary process. I am the BPAC’s staff liaison. At the Committee’s request, I bring a poster of some high-level principles of good parliamentary practice to every meeting. Several committee members have said this has helped, especially since they only meet about six times a year. The BPAC has developed a culture of respectful and courteous dialog, which I think has a lot to do with its deference to parliamentary process. The Committee’s parliamentary-fu is by no means perfect. I have told the members that they are practicing democracy. 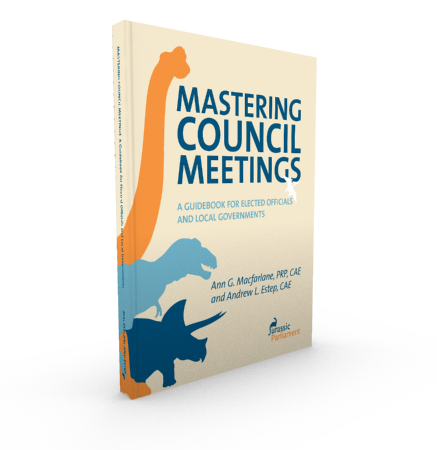 As long as they stick to the higher-level principles – authority is with the group, decisions are better when everyone has a chance to weigh in on them, always err on the side of transparency – there will always be opportunities to refine the practice. Sometimes we make mistakes with the details, but I try to assure them it’s ok, as long as we’re adhering to the larger principles. Thanks for all you do to help us practice better democracy! Thanks Ann and Michelle in Olympia. Excellent resource! Thanks for sharing.